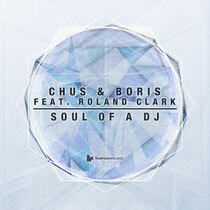 Toolroom Records released ‘Soul Of A DJ’ this week, a collaboration between Chus, Boris and Roland Clark. Included in the release, Tony Dee and Hollen provide a remix crafted for the darker side of dance floors. One half of dance music duo Chus & Ceballos, DJ Chus has been instrumental in the creation of the underground ‘Iberican Sound’ movement and his contributions to the international dance music scene have resulted in him collecting many awards throughout his career, including ‘DJ of Year’ and ‘Best House DJ’ from Spanish Deejay Magazine. Having been a resident at every major New York club, including Pacha, Crobar and Roxy, DJ Boris finished in the top 5 in America’s Best DJ fan poll. His track with Chus, ‘Soul Of A DJ’ is a deep, techy, track where Roland Clark’s vocal is its focus as he surveys the soul of a DJ. Alongside the original, Tony Dee and Hollen’s remix is a tech-fuelled take on the track, which takes it down a darker route, ideal for those after-hours parties. As a bonus, Roland Clark’s accapella is provided to inject some extra soul into the proceedings, for those who like to get a bit experimental. Have a listen below.